Restorative Justice Project students have the opportunity to work in various settings from schools and neighborhoods to prisons. Students engage with community members, institutions, and organizations to respond to crime, violence, and other issues such as racial disparity in the criminal justice system. RJP students manage a caseload of victim-offender dialogue requests, where students prepare for and co-facilitate face-to-face meetings between victims and their offenders. Cases typically involve sensitive and violent crimes. This restorative justice process helps victims find answers to their lingering questions in the aftermath of a serious crime and to seek an understanding that reaches beyond the crime itself. Participating in a victim-offender dialogue process frequently has a profound, positive impact on the lives of the people involved. Throughout this intensive process, students cultivate and hone their mediation and interviewing skills and gain valuable insight into listening, asking difficult questions, multi-party communication, identifying creative solutions to complex issues, and managing conflict in challenging situations. 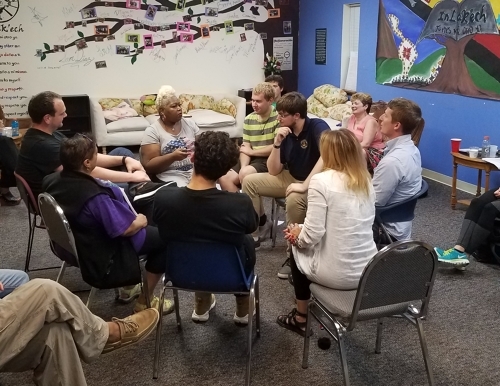 The Restorative Justice Project also involves students in restorative practices in the local community through opportunities to address conflict and harm in neighborhoods and schools. By utilizing restorative practices, students provide positive alternatives to the criminal justice system and help fill in gaps where it may have failed or not be the best solution to an issue. Students take on leadership roles, collaborate with the project director to develop restorative justice programming, and work directly with victims and groups of offenders who are either incarcerated or transitioning back into the community. "For students eager to explore innovative alternatives to the traditional criminal justice system, there is no better placement than the Restorative Justice Project. My experience with the project was second to none as a law student. I can honestly say the project offers students an opportunity to facilitate transformational results for victims, offenders, and the community at large." 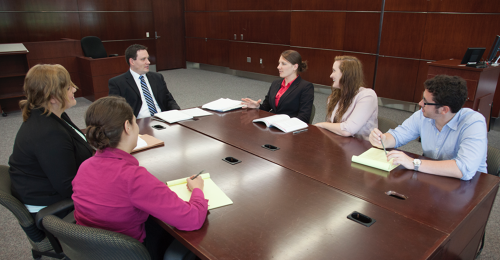 "Working for the Restorative Justice Project was the most rewarding thing I did in law school. It was a unique opportunity to deeply engage with clients, exactly where they were, and work to find common ground, if possible. It taught me that our legal system has a lasting impact on victims and offenders, and helped me become more confident in my ability to speak with clients about sensitive and difficult topics. Although I am not going into criminal law, I will use the communication skills I developed through the Restorative Justice Project for the rest of my career." Because of the complexity and duration of many victim-offender dialogue cases, the Restorative Justice Project requires a three-semester commitment, starting with the summer term. Students work full-time (forty hours per week) for twelve weeks, receiving a stipend and seven credits for the summer program. Students also receive tuition remission for their summer credits. In addition to their case work, the students' summer clinical experience includes a classroom component and guest presenters from across the spectrum of the criminal justice system: individuals from the Wisconsin Department of Justice and Office of Crime Victim Services, Department of Corrections and Office of Victim Services and Programs, as well as special prosecutors, institution program staff, DAs, victim/witness staff, domestic violence specialists, and a retired Wisconsin Supreme Court Justice. Students continue in the program during the academic year with a fall and spring semester commitment of three to four credits (twelve to sixteen hours per week) each semester. For more information, contact Project Director Jonathan Scharrer at jonathan.scharrer@wisc.edu.